After posting a pair of solid victories last weekend, the Turkey Valley girls’ basketball team (12-7, 10-4 UIC) looked to continue that trend, but came up empty Monday. Monday night, the Lady Trojans ventured into MFL MarMac (19-1, 14-0 UIC) Bulldog territory, falling 65-26, on the road. The Bulldogs went ahead 15-5 after the first quarter and created a larger spread by halftime, leading 34-13. The momentum continued to swing in favor of MFL MarMac in the second half, leaving TV with a loss. 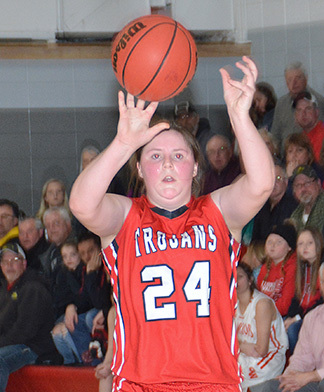 Turkey Valley will begin its road to state versus West Central tonight (Thursday, Feb. 7), at 7 p.m. With a win, the Lady Trojans will encounter Kee Tuesday, Feb. 12, at 7 p.m. at Waukon in the Class 1A Region 2 quarterfinal.